We've heard the gesture: “I'm so sorry! I didn't see you.” While the apology is nice, it does nothing to ease the pain you feel after a serious Missouri bicycling accident. More than 50,000 bicyclists are injured in auto accidents in the United States each year, and that only includes the ones that file a police report after a trip to the hospital. The majority of Missouri auto accidents involving bicycles occur when a driver either fails to stop properly at an intersection or attempts to overtake a bicyclist. Whether the driver completely misses the bicyclist in a blind spot or misinterprets the bicyclist's speed, either scenario typically ends with the bicyclist in the hospital while the driver walks away with little to no injury. This can be especially frustrating when it's not your fault. In fact, only 10 percent of all serious bicycle accidents are due to rider error, yet it's almost always the rider who pays for another's mistake. When you've suffered a traumatic injury while riding your bike, you need the experience of a Missouri bicycling accident attorney to help you recoup the necessary damages to get your life back on track. 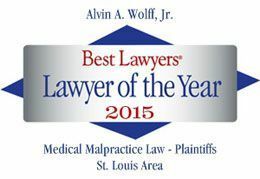 We at the law offices of Alvin Wolff, Jr., can help. Call us at 877-241-1020 to set up a consultation. Be sure to ask for a free copy of our book: The Total Guide for Motorcycle and Bicycle Accident Victims in Missouri.